Walpole St Peter Highway postmill and its Mill House were at Waterdown Green. The mill had a roundhouse and was turned to wind with a fantail. Patent sails were used to power 1 pair of French burr stones, 1 pair of Peak stones and flour mill. Walpole St. Peter was in the county of Norfolk until 1837 when it was transferred to the Isle of Ely, Cambridgeshire until 1938, when the parish was transferred to Freebridge Lynn in Norfolk. A substantial POST WIND CORN MILL in full Trade, with Patent Sails and Winding Tackle, One pair of French and one pair of grey stones, Flour Mill complete. a brick Roundhouse attached, with a well built brick and tiled Dwelling house, Bake house, Barn, Stable, Granary, Yard and 3 acres of Land lying under the same. Possession may be had on 6th April next. Apply to Mr. Michael Brown, the Tenant and Mr. Samuel Sharpe of Walpole. Letters post paid. A Steady active SINGLEMAN competent to take the entire management of a Windmill at Walpole. Satisfactory Testimonials to Character and Competency will be required. Apply to Mr. S. Giddens of Walpole St. Peter. N.B. This advertisement will not be continued. All that WIND CORN MILL with four COTTAGES, BARN and BAKE HOUSE and all those 2a. 2r. 0p. 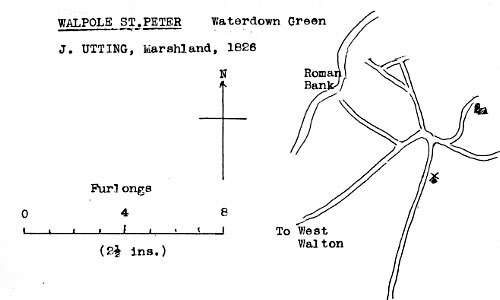 (more or less) of Arable LAND in Walpole St. Peter in the county of Norfolk, in Newcroft Field, next West Drove, west and land of the Rev. C. H. Townshend on all other parts, partly in hand and partly in the occupation of Mrs. Milbourn, Mr. J. Winkley and Mr. D. Ashton. The above property is most eligibly situated for a continuance and extension of the first rate business which has been conducted on the premises by the late Mr. Giddens for many years. Further particulars on application to Mr. Richard Munson or to Mr. William Johnson, Walpole (the Trustees for Sale); to the Auctioneer, or at our Office. WANTED a Single Man as MILLER and BAKER. Apply to Mr. Batch, Walpole St. Peter, Wisbech. with 2 pairs Stones, all machinery, wood, bricks etc. to be cleared off the land within one month from the date of sale. Sale to commence on the premises near the Black Horse Inn at 3 o'clock in the afternoon.